There is street art all over Berlin, in fact there is so much that it would be difficult to see it all. The area of Kreuzberg has quite a number of pieces so we spent one afternoon there having a wander around. This piece is by Brazilian street artists Os Gêmeos. Even though Berlin is full of concrete and industrialist styles, there is still colour everywhere. I just loved this bright red building in the middle of an urban street. I was fascinated by the history of the Berlin Wall as I knew so little about it prior to my visit. This piece is by the Typography Museum in the Mitte area and it really stood out for me about what a brutal and terrifying period this wall represents. There are all sorts of random pieces all over the city and this one just caught my eye as we walked along the riverside past Museum Island. This is an amazing organ inside St Mary's Church near the television tower. It was so ornate and beautiful I just had to snap it. Another longer shot of the wall outside the Typography of Terror Museum. Here you can see the foundations underneath which are what remains of the cells of the original Gestapo building. You can only imagine what things went on within those walls. The altar of St Mary's Church where we all sat and took a minute. Shot of the TV tower next to St Mary's Church. It is the tallest structure in Germany and second tallest in the EU - no wonder it can seen from all over Berlin. The Trabi car is famous in Berlin and this fun, vibrant one sat outside a souvenir shop in Alexanderplatz. Another from St Mary's Church, a mosaic recreating the murals that can be found in the porch of the church, many of which have been badly damaged and are undergoing restoration. I saw this building on a tour of the city we took on a rickshaw (highly recommended). The street it is on, Sophienstrasse, is one of the oldest in the city and was once filled with craftsmen of all kinds. Today a lot of work is going into restoring what is left of this street. This was taken from our rickshaw ride around the Hackescher Market area, which is filled with courtyard complexes accessed by archways off the main roads, filled with amazing tiled buildings and shops and bars off the beaten track. This is the New Synagogue which was built in the mid-1800's and one of the few buildings that survived Kristallnacht, when Jewish buildings in the city were destroyed by SA paramilitary forces. It really touched me to look at a building that was around during that time and just another reminder of how much devastation this one city has been through. 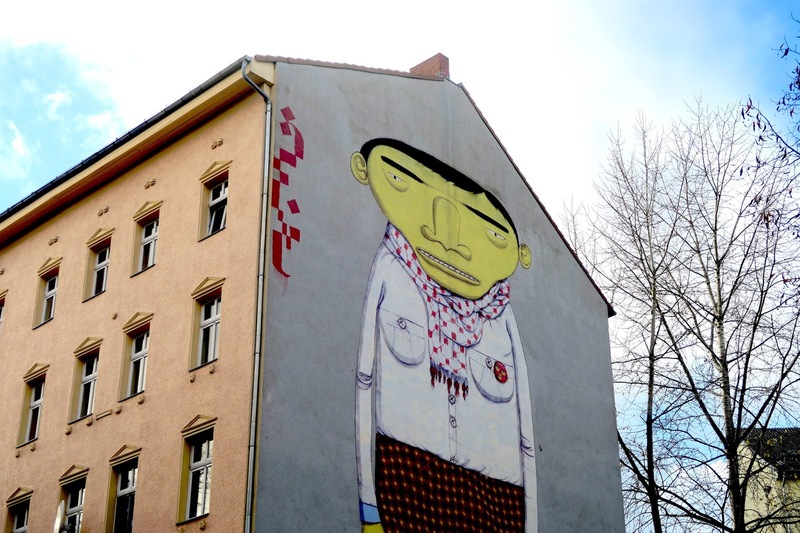 Not just street art, Berlin is filled with gravity of all kinds. Whilst many people look on this as ruining the facade of a place, I felt it gave life and colour to this concrete city. One from when we visited the Memorial to the Murdered Jews of Europe. I think this really captures the eeriness of the place, which is really just blocks of concrete placed in a big square, but which represents so much more. Another piece of wall art we came across, this one is by the artist Nomad and definitely caught my eye with its bright colour. I found these on the side of one of the remaining parts of the wall and thought it was a touching tribute.